In April 2003, Northwest Airlines introduced its first new livery since 1989, to be phased into the entire Northwest fleet over a five-year period during regularly scheduled repainting. In 2009 Northwest merged with Delta Air Lines ending the use of this livery. The DC-10 was the first wide-body tri-jet to enter commercial service. Production was started in 1968 and first deliveries were in 1971. When production ended in 1989 a total of 446 DC-10s had been produced. 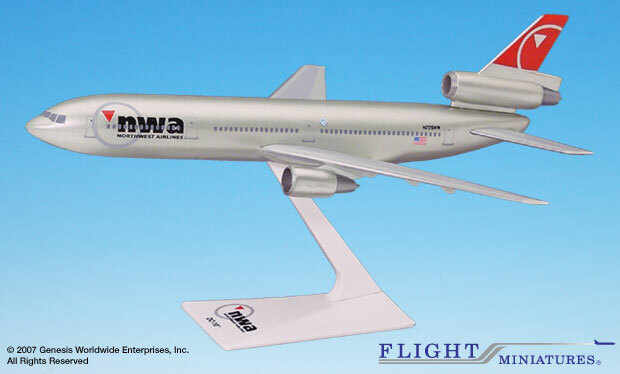 Six models of the DC-10 were developed for the commercial market, and one military model was built for the U.S. Air Force, the KC-10.